I woke up from a late night nap, looked out my window and was confronted with a vision of white. Actually getting out of my bed for closer inspection, I was delightfully surprised to see it was Fog. I’m not particularly a fan of fog, but I love it compared to snow. Bring on all the fog possible if it means the snow season is over this year. That’s probably not the case. But tomorrow it’s supposed to be a warm, no-jacket-needed fifty degrees, and that’s good enough news to make me wiggle my toes and do a little happy dance that has never been witnessed by another soul. Requesting time off at my work is a not-so-complicated process, however actually getting the days is harder than you’d think. This coming from a person who gets most of the days she requests – it’s still not easy. I put my requests in six months ahead of time and usually schedule them around my days off so that I’m actually only requesting two days every other month instead of four or five. It’s all put in through the computer at work, and then my Overnight Manager looks at it, and takes anywhere between a day or three weeks to Approve or Reject it. I’m currently praying that I can manage to find somebody to fill my Easter shift that I requested in December and was denied for. I’m hoping to meet Jarred’s family for the first time (sosososososososo incredibly nervous) and I’d like to not have to come home the day before Easter while everybody is on the highway doing the exact same thing. I also just put in requests for July (Mayhem Fest 2013) and three days in August for a wedding. I’m bracing myself for a long few weeks of “Bess, all these vacations, what am I going to do with you” followed by denying half of them. All of this would easily be solved if they would give me Full Time (I work full time hours most weeks anyway) and allow me to move out on my own. On a brighter note, I broke out my trusty slow cooker yesterday and made soup! 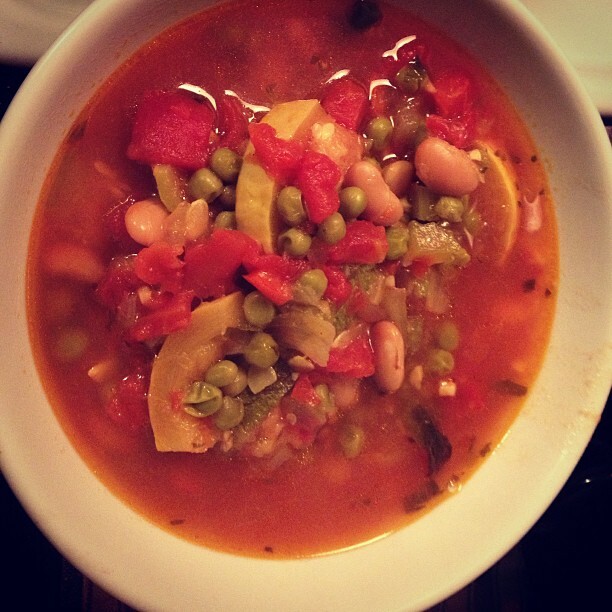 Vegetarian-Wheat Free- Minestrone to be exact. I wasn’t able to completely follow the directions of the recipe as my Slow Cooker must be a different size than the one originally used. A fact that I didn’t discover until after I’d already started the process of combining ingredients. It is delicious nonetheless though! Chock full of vegetables and that warm-you-all-the-way-to-your-bones comfort food flavor. Ready for the complex part guys? Step 1. Prepare and combine all ingredients and mix well in your Slow Cooker. Step 2. Set to high and entertain yourself for the next five hours. 1. I would probably wait til hour five, or even about 20 minutes before serving to add the peas when I make this again, I like sweet peas because they aren’t soggy or mushy. They were still good in this and didn’t take away from my enjoyment but I’d like to see if adding them later on would make a difference. 2. The amount of Broth you add is really dependent on your own personal preference. I like my soups nice and full of broth so I wrap my hands around the bowl and sip it like a warm cup of comfort. But if you prefer a fuller soup I’d say one box is plenty. I actually just added the second box of broth to what’s left and set the cooker to low to incorporate the flavors for my lunch for the rest of the workweek. 3. Add whatever vegetables you like! It’s all about what you like! Hope you enjoy the soup if you choose to make it! 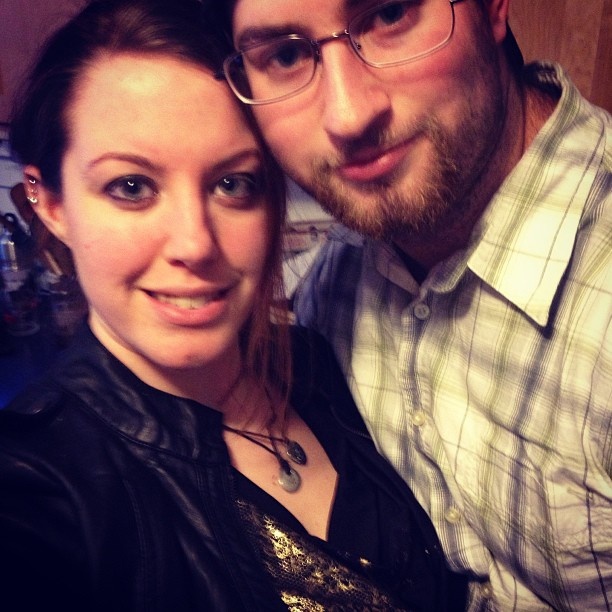 Time to reminisce my times in Boston and Saugus with my Sweetie, while watching Cheers on Netflix. What I would do without Netflix, I honestly do not know. Til next time, enjoy this warm weather if you have it!